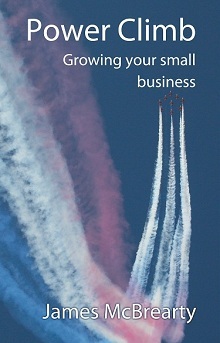 An extract from my second book, Power Climb: Growing Your Small Business which was published in 2012. Finally in this chapter, I revisit some of the points from the hot dog seller story. When you’re reading news articles it’s important to realise that perhaps the author could have their own opinions clouded by their impressions, which could lead to inadvertent sabotage. One of the claimed sources of how the word sabotage came into use is from the Netherlands in the 15th century when workers would throw their sabots (wooden shoes) into the wooden gears of the textile looms to break the cogs, feeling the automated machines would render the human workers obsolete. I’ve heard the changes occurring in business now likened to the industrial revolution, which I think is an ideal way for people to think of these. The music industry has already been through massive changes with the introduction of digital delivery. The print industry is currently in the process of change, with Kindles/etc. starting to replace paper for the delivery of content. There are already more books sold by Amazon on kindle than in print now. The TV industry is another one where changes are coming. In the past you needed an expensive TV studio and/or equipment, combined with many staff to produce content. Now, my iPhone can produce broadcast quality HD video, which can be edited on the phone and then uploaded to YouTube – then shared with millions of people and at very low cost. Indeed, many people ‘time shift’ their TV watching so that it fits in with their own needs, rather than the times the TV stations prescribe that you will watch something. It’s also affecting advertising – if people are watching a prime time programme in the morning was it worth paying top money for the evening prime-time advertising slot when they didn’t watch it then? As people ‘time shift’ their programming many fast forward through the adverts anyway. This is one of the reasons product placement is increasing in use, and with digital delivery of programmes there are no adverts anyway. These changes are something to be mindful of when reading or watching reports from the traditional media on the rise of the new economy. Changes in business are something that I have experienced myself in my own industry, for example how I became ‘the twittering tax man’ and as a result presented to 85 chartered accountants about Social Networking, something I wouldn’t have thought to be doing a few years ago. You can also download the full kindle version straightaway from Amazon by clicking here.